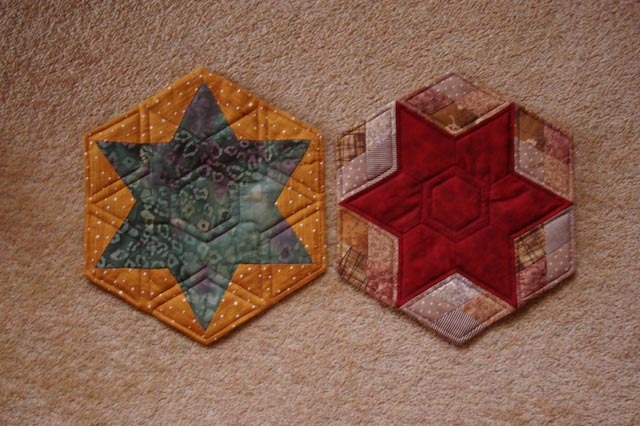 These were actually sewn about two or maybe even three years ago when I was into English paper piecing but thought I would do a bit of quilting this week. 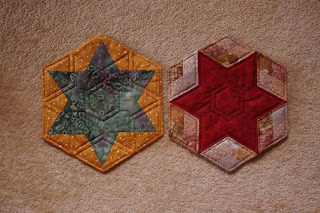 The star on the right is the front of the block while the star on the left is the back, making it into a double-sided QAYG project. The corner diamonds on the front is made of four different diamonds and the star of seven pieces, while the green in the back is a single piece and the yellow frames are each separate. I decided to simply echo 1/4in from the main seams on the front and these lines are more easily seen on the back. 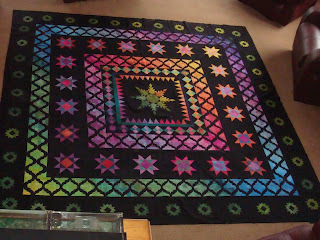 I haven't yet decided how many blocks to make but have finished, but not quilted, four more blocks. Haven't decided yet if I will call it a day and simply use them as placemats or continue onwards and make a quilt out of the blocks. 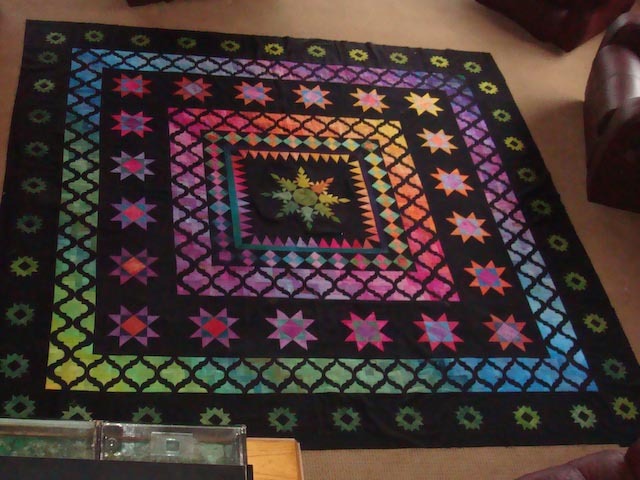 Well in truth I didn't finish my quilt this week. I managed to finish it just before we left for our holidays but I didn't have a chance to upload it. The finished quilt looks completely different to the original plan and I am very happy with it. Off to the longarmer next. Well we are back. Actually returned just a little over a week ago but have been so busy I haven't had a chance to write anything. Well just over a month ago Paul was surfing the net. He found a fantastic special 80% off on an 11 day cruise and 85% off the connecting cruise. Both cruises spent a day in Boston, which is where Richard is studying. So no decision was needed. Booked our tickets and flew out five days later. This bridge was in Boston and looked really colourful in an industrial estate that we walked through. 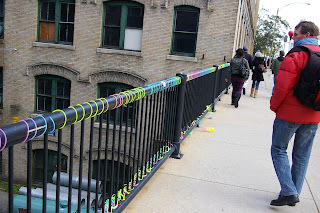 Very simple idea, it is simply plastic slinkies wrapped around the top rail and more simply hanging from the lower end of the struts.